This week’s New England Journal of Medicine has a fascinating study that followed 115,000 health professionals for upwards of 30 years to see if regularly eating nuts – walnuts, peanuts and others – was associated with fewer deaths. The answer is “yes,” and you can read details from the source here. Today’s blog uses this study to teach how to read statistical charts for fun and health. The lesson is not entirely geeky. Once you understand the basic law of large numbers — and the downside of trying to draw conclusions from small numbers — you’ll be armed to make sense out of lots of the statistics that bombard us every day. The basic chart published with this study is reprinted here. 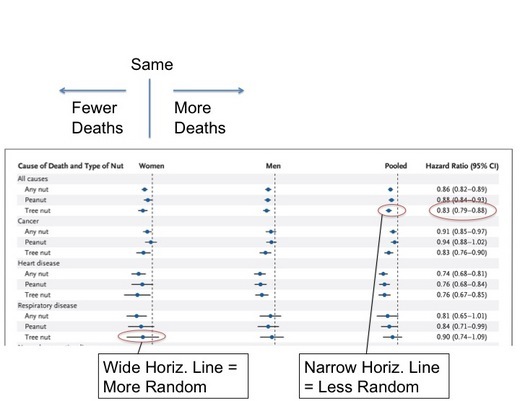 It’s called a “forest plot.” It’s easier to read than you might think. Here’s my annotation of the basic layout of this forest plot. You’ll see that the three vertical dotted lines — one for men, one for women, and one “pooled” — are key to understanding it. They show the dividing line between good (on the left of the dotted line) and bad (on the right). The further the blue dot gets from the vertical line, the stronger the effect. If the blue dot is right on the dotted line, that would mean the ratio of deaths in the nut-eating group was the same as among the nut abstainers. Most of the time, though, you see the blue dot on the left, which means fewer deaths among the nut eaters. 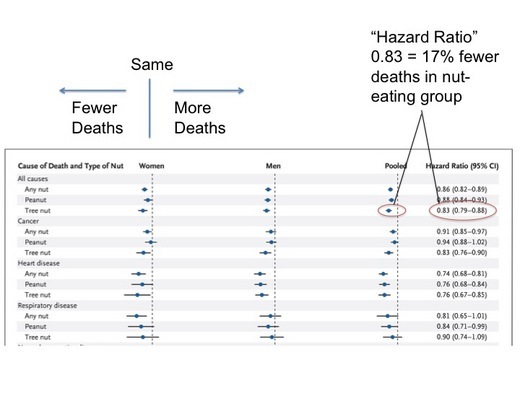 Below I’ve circled the numbers on one of the findings: For people who ate “tree nuts” (walnuts, almonds, etc. 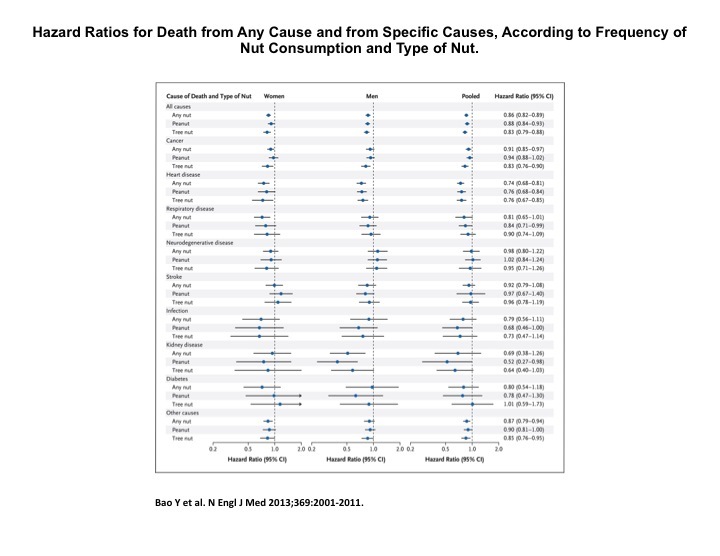 ), deaths from all causes were 17% fewer (1.00 minus 0.83) than the non-nut eaters. Now here’s the next key thing to notice – the thin horizontal lines that cut through the blue dots. It’s called a “confidence interval,” something baffling and off-putting to us non-statisticians, but easy to grasp once you see it in a picture. These horizontal lines are measures of how statistically strong the results are — the wider spread of the horizontal line, the weaker the finding, and vice versa: the narrower the spread, the stronger the chance that the blue dot is in the right place. 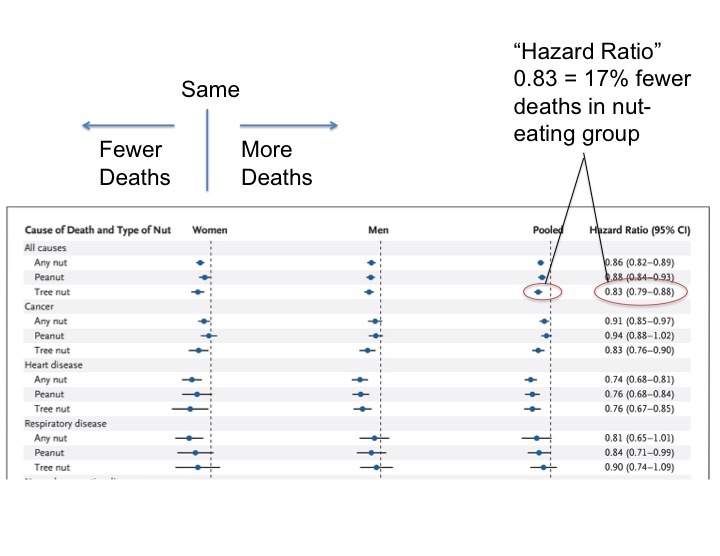 Look at the example I circled at the bottom of the forest plot chart: this is the ratio for respiratory disease deaths comparing tree nut eaters to non-nut consumers. The basic result is 0.90, a 10% reduction. 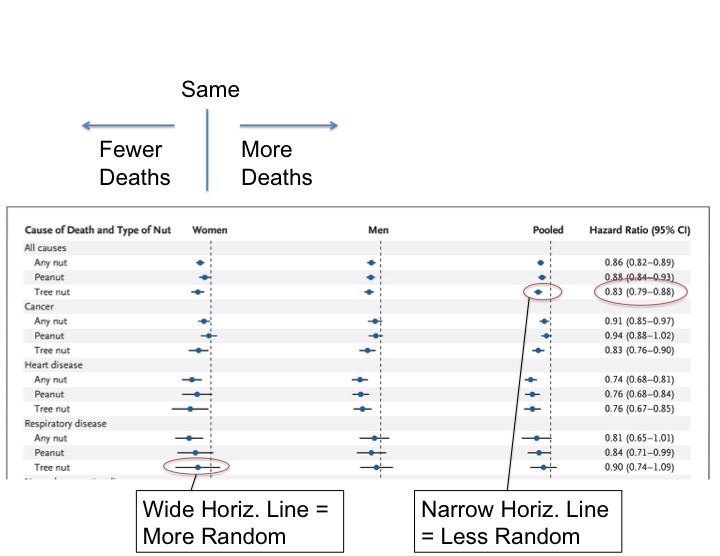 But see how the horizontal line stretches all the way from 0.74 – 26% fewer deaths – to 1.09 – 9% MORE deaths. Which is the right number? We can’t tell. A statistician can only tell you that if the same test was run 100 times, it would fall in this range 95 times. 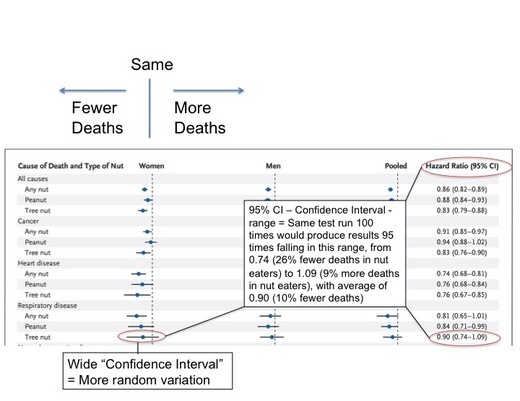 The fact that one end of the interval falls on the other side of the dotted line of neutrality means that that result is not considered “statistically significant,” at least if you’re trying to guess whether nut eating is associated with fewer deaths from breathing issues. Why do statisticians use the 95% “confidence interval”? It’s a more precise way of rendering the concept that to be statistically meaningful a “P” value needs to be 0.05 or less: i.e., 5% of the time, or one in twenty, this result would come about by random chance. The “confidence interval” gives you a lot more data than the simple “P” number. Back to the law of large numbers. The reason the numbers at the top of the chart have narrower “confidence intervals,” shorter horizontal spreads, is that they are crunching very large numbers. This study reported on 115,000 adults followed for 30 years. When you lump all comers, that’s a lot of years. 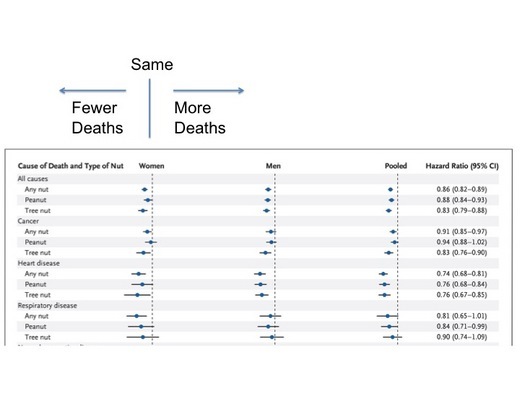 But when you start slicing out particular causes of death, and separating tree nuts from peanuts, you get fewer and fewer person-years and more and more chance that the results are statistically flukey. 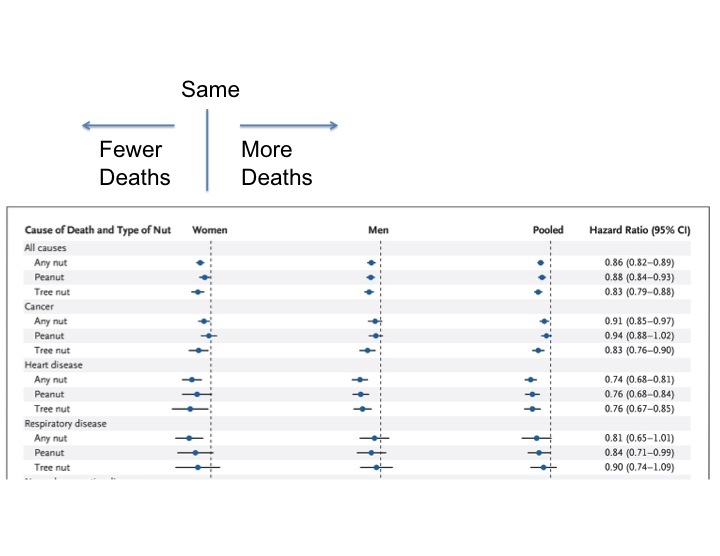 Notice how the dots cluster near the “no effect” dividing line, with some really wide “confidence intervals.” But when all the studies are put together at the bottom, the statins win out over placebo (albeit not by much). Back to the nuts: By the way, bear in mind this isn’t necessarily cause-and-effect. It could be that eating nuts will add years to your life. 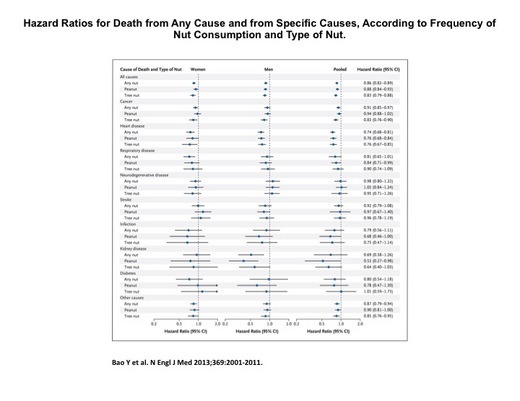 It could also be that people who eat a lot of nuts are “health nuts” who do all sorts of things to prolong their lives, so nut eating is just a marker of longevity and not a cause. Meantime, though, it can’t hurt to chomp down a few walnuts.